I’ll be honest. I procrastinated with this one. A lot. On purpose. Because reasons. Part of what I realised I didn’t like after reading the first volume of Jonathan Hickman’s New Avengers was that it was damn near impossible to feel emotionally invested in any of the protagonists. I compared the book to the distinctly anti-heroic-bordering-on-villainous take in Uncanny X-Men, but the more I think about it the more it becomes clear that New Avengers is far closer to the bad guy side of the coin. That’s not a problem that shuts out anyone writing a book about villains. Some of the best works in contemporary fiction have villain protagonists who are engaging enough that we can get into the story (look at Breaking Bad, for instance). A story that follows an unequivocally “bad” guy isn’t something I’m not able to dig. New Avengers is a little different. 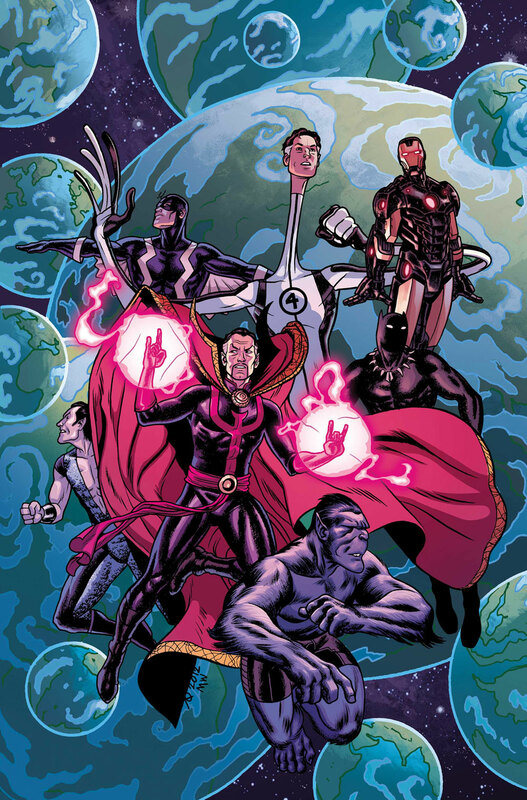 It’s clear we’re supposed to treat Iron Man, Mr Fantastic, Namor et al. as anti-heroes straying dangerously close to the border between Daredevil and Dr. Doom. They’re taking risks, engaging in morally grey activities but all for the betterment of the world. They’re badasses the same way Rust Cohle in True Detective was; they get the job done, but you wouldn’t exactly label them as affirmative action figures so much as tools accomplishing a task without thought for morality. What I’m saying is it was difficult for me to get around to reading Other Worlds given how much that thought pervaded my mind after reading Everything Dies last year. 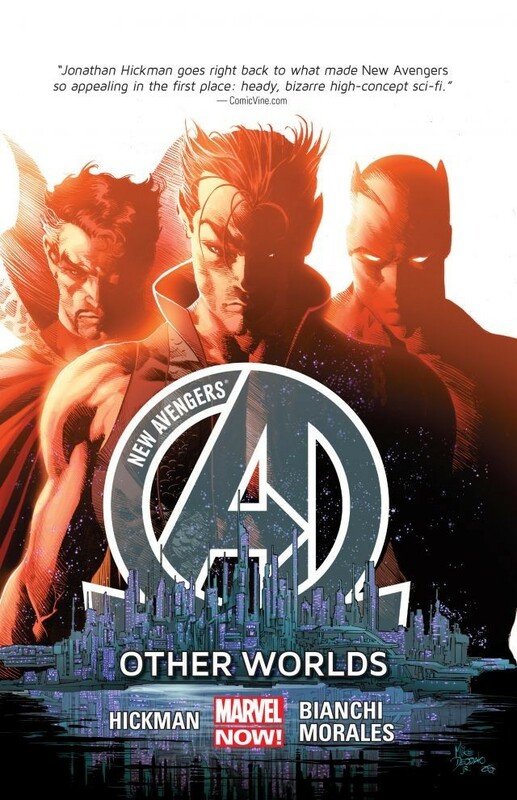 New Avengers seemed to exist in this limbo between anti-hero and villain storytelling that, while it’s definitely a damn good read, was not the kind of title I felt like diving back into the same way I do whenever Saga or Scott Snyder’s Batman releases a new volume. Did I really want to go through more of that “neither sweet nor bitter” storytelling when there are far more family-friendly titles I could review, like the new Black Widow or MIND MGMT? Well, the answer is “yes”, if not least of all because I love Jonathan Hickman and missing any piece of his Avengers and New Avengers puzzle would niggle at me like a loose tooth. Blame my collector genes. Surprisingly, Other Worlds seems to ditch a lot of grey morality storytelling that composed its first two volumes and is instead more interested in, well, other worlds. A good half of the volume is literally a glimpse at similar universes to our one that get completely destroyed thanks to all that multiversal entropy business Everything Dies introduced. 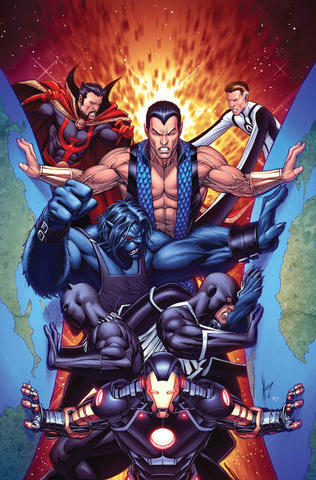 Variable versions of the Avengers, both New and vanilla, fight in vain against the Mapmakers while Iron Man, Mr Fantastic, Namor et al. sit back and fret over what’s going to happen to them once said Mapmakers are finished with their multiversal canon fodder. 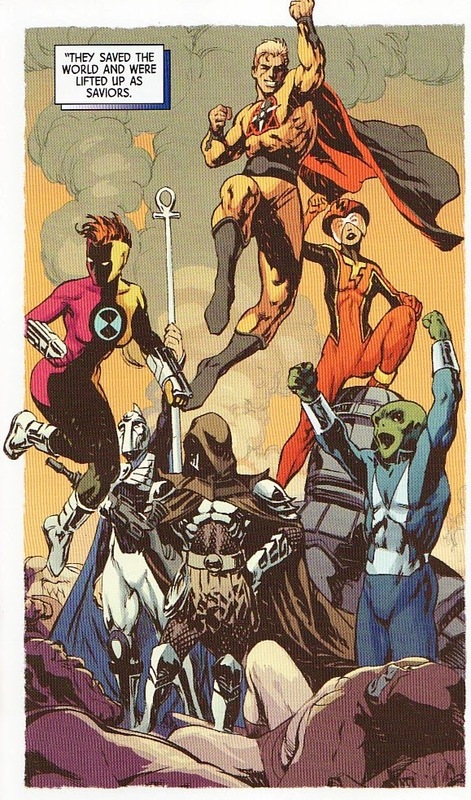 Then a universe with a thinly-veiled version of the Justice League shows up. Let it never be said Hickman writes stories that feel samey; most of Other Worlds deals with astrophysics and complex multiversal theoretical shenanigans that almost any other comic not written by Grant Morrison would not ever attempt to serve to its audience. 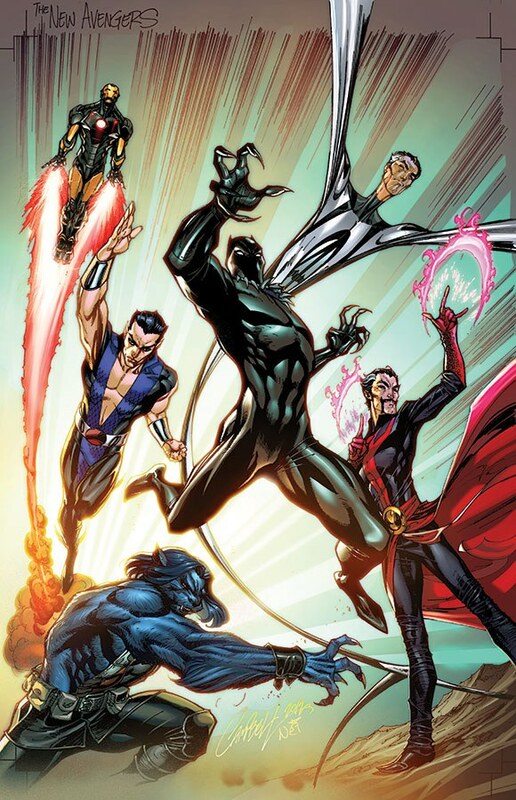 Wrapped around the “hard” science fiction (for though I don’t know myself, I’m pretty sure several multiverse theorists might take umbrage with some of the techno-babble Tony Stark spouts) is a bit of a character moment between Namor and Black Panther that kinda echoes a Londo-G’Kar relationship. Yes, I have been watching Babylon 5 lately, how did you guess? Though it’s not at all a bad book, Other Worlds isn’t so much a story in itself as it is a twin gun plot purpose cannon. What I mean by that is it exists to serve two (possibly three) purposes within its pagecount: one is, by showing us all the universes collapsing as ours gets further up to being next on the list, to put a human face on those numbered, nameless worlds as they spiral towards destruction. I guess it helps avoid the disconnect audiences might get trying to visualise faceless casualties in a disaster movie when a character states that a million billion souls have bought farms by showing us who’s dying and why. It’s nothing near tragic, but it’s something I guess. Two is to make it clear that this entropy and the Mapmakers accompanying it is not a threat to be trifled or simply beaten into submission. This is the part of Hickman’s New Avengers plot I both like and dislike the most; the former, because it avoids repetitious use of the good ol’ “punch it in the face” trope that solves most superhero narratives, and the latter, because it feels distinctly unlike a real Avengers plot in and of itself. It’s the kind of science fiction threat I’d expect to see in Star Trek or, again, Babylon 5, and while it’s not unwelcome for an Avengers book to be about something different than somebody wanting to take over Earth or just kill a bunch of heroes for giggles, it does feel just a bit incongruous. Adding to the incongruity is the artwork, which I’m forced to split down the middle in my critique of it. One half, handled by Rags Morales of Action Comics fame, is great, gorgeous and engaging. The other, illustrated by Simone Bianchi, is somewhat messy, thick and throws me from the story the same way Fillipe Andrade did during his Captain Marvel work. I happen to think Bianchi’s a great artist, particularly loving his work on Astonishing X-Men: Ghost Box back in the day, but it doesn’t really work here. I guess since the narrative’s migrated a little from the grey morality that Steve Epting masterfully illustrated during his work on the first volume that we need something different, but I’m not sure Bianchi was the right fit here. Still, once again, I give points for something a bit different. Dialogue’s hard to judge this time around. As I said it’s got a ton of techno-babble that adds to the Star Trek vibe I get, and while our core cast of characters seems consistent I don’t really take much from those in the other universes – including and especially the not-Justice League at the end. It doesn’t quite feel like standard Hickman wordiness the same way the layered and hinting dialogue in East of West and Infinity did, which does detract from what did make Everything Dies a bit more engaging. Also, I can’t remember, did Black Swan explain what all those “Yabbot” words meant earlier? Coz she struck me as being like someone who speaks fluent Japanese, knows that you do not, and chooses to converse and insult you with it regardless. Now that’s just rude. Also, wasn’t Thanos stuck in amber somewhere here after the end of Infinity? They seem to have forgotten him, which you’d think would be difficult when it comes to an eight-foot-tall titan from the moon with a face like a cleft grape. I feel like Other Worlds works better as part of the whole rather than on its own, which both helps and hinders it in a recommendation. If you’ve followed Hickman this far down the rabbit hole then it’s worth it to read all the pieces, but as a text on its own it does not stand up even without all the greyer disconnect that riddled Everything Dies. Maybe wait for the run to end so you can just marathon it. I’d say that’ll make it easier to keep all the techno-babble in check under one umbrella.